By the way, where does one find the 1.25" visual back that will thread into the drawtube? Yes, I can use a 1.25" to .965" adapter, which I do, but it would be nice to get the adapter. Edited by Marc-Andre, 08 November 2018 - 06:15 PM. Tom, the Vixen 36mm to 1.25" thread-in adapters will not fit the Royal Astro focusers that have 2 tubes -- inner manual / coarse & outer rack & pinion. The inner tube is usually a 30mm size. You can remove / replace it with a chrome water pipe (usually for sink drains) that will accept 1.25" accessories by adding a pipe fitting & tapping it for a set screw. Edited by Bomber Bob, 08 November 2018 - 07:38 PM. Ditto. There was a thread on CN about doing this a year or so ago. 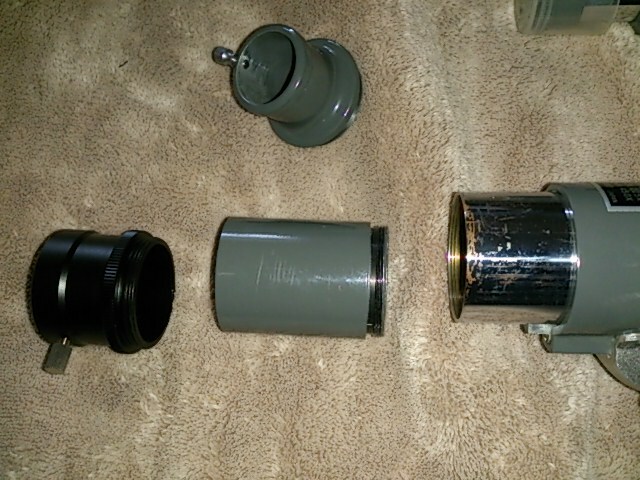 For my Sears 3" 6339a, I purchased a 12" 1¼" pipe drain, and added in a 3" sleeve, with a ID of 1¼". In the thread a aluminum sleeve was used. I had a brass one, it fit very tightly. I added a set screw. It works great. I took the original draw tube and put it aside. I actually did the drawtube mod discussed a year or so ago, didn't care for the outcome, will just use a 1.25" to .965" adapter I guess. It's true, the Vixen adapter will not fit the sliding drawtube, but it does fit the outer tube. 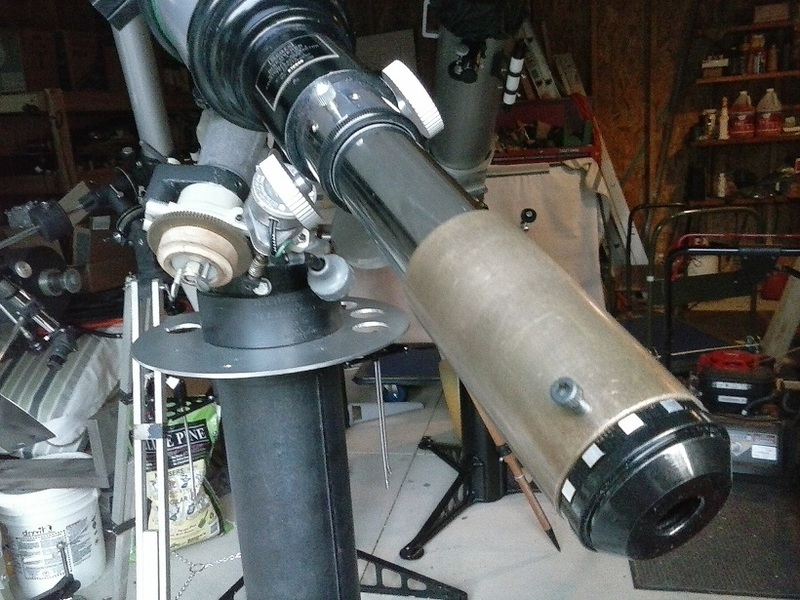 Here is what I did with my R-61D and have done on a 10TE (same focuser). You remove the inner slider completely, and then use a thread-on extenstion, with the Vixen adapter threading onto that. Plenty of travel for any eyepiece/Barlow combination, but I have a longer extension if ever needed. I keep the slider in the box so the scope can be quickly restored to factory condition if desired. I just got two Vixen adapters direct from an eBay seller in Japan, something like $14 each. Adorama carries the extension tubes, as well, in a couple of different lengths. I've managed to accumulate a good collection of them over the decades and glad I did because new ones are pricey. Once I discovered them in a storage box, I abandoned all the home-brew 1.25" slider modifications. This is so much cleaner and stays collimated much better. I found a never-used 8" LX200 at a local estate sale for a reasonable, if a bit high, price. I made them an offer for slightly less and will be picking it up tomorrow if I win. EDIT: Nope, some pawn shop bought it for $650. Edited by Augustus, 10 November 2018 - 09:41 AM. There's an off-the-shelf alternative to the drawtube mod for Tasco/Royal. It means several e-packets from China and about 25 dollars total cost. Use a 30mm (male) to 42mm (female) step-up ring on the Tasco drawtube. This will tighten up only a couple of turns on the drawtuıbe — but it's enough to be secure. I can't be certain it will work for your Tasco because the threads may vary, but it worked for several of my scopes that don't accept the standard 36.4 Vixen adapter. edit: in this photo the visual back has a male 42mm thread so the 42mm male/male adapter wasn't needed. But you get the idea! Edited by catboat, 09 November 2018 - 02:46 PM. A tale of two Tasco 10TE's. I've had a Tasco 10TE for a while, great scope and mount, been looking for another one as the mount is a bit rough, got one last night. Turns out the two serial numbers are only five numbers apart! 970550 on the first one, 970555 on the one I got last night. First one came from the Salem Oregon area, second one from Chico, CA. Interestingly there are significant differences between the two, the one with the higher serial number has what I thought is the earlier drawtube style where it's much larger in diameter, black enamel and push/pulls into the main tube vs 550 which has the smaller diameter chrome drawtube that pushes through the focuser tube. Both focus knobs are metal, 555 has dished metal focus knobs, 550's are flat. The tripod of the 550 came with the seven hole spreader, 555 four hole. 555 has a single bolt cradle, 550 has a dual bolt saddle. By the way, 555 is missing a pair of collimation screws, one each long and short. Of course I can just use hardware store bolts but I'd like to have the originals...anyone have any spares they are willing to part with? Hmm, I have a theory on your two Tasco 10TEs. I think that the "555" scope may be 10 years older than the "550" scope. With both serial numbers starting with a nine I think your "555" is a 1959 and the "550" is a 1969. Reason being I believe I have read that the slide out style focuser was only made in 1959 and maybe early 1960, then Tasco changed over to the more common slide out tube. Other evidence is the older style dish style focuser knobs and the older style single bolt cradle on the "555". We actually need the Tasco answer man, Stargoat, to take a look at this as I'm sure he could confirm or debunk my theory. Chuck, could you elaborate a little on your set up? Are there threads on the inside of the larger chrome tube on the Tasco? Do you have a part number for the threaded extension tube? Hi Tom, with respect to the older 555 scope, could you PM or post a pic of the back side of the round cardboard Passed JTII tag please for me? Is there a gold foil rectangular Passed JTII tag on the bottom side of the focuser housing as well? Also, please see this posting where I've given some more information for scope 970555. Tasco 10TE circa 1959/60 first version. I'm sure I've posted more information in the past as well. With respect to the coincidence of the two serial numbers, especially with 970550 being the newer version than 970555. 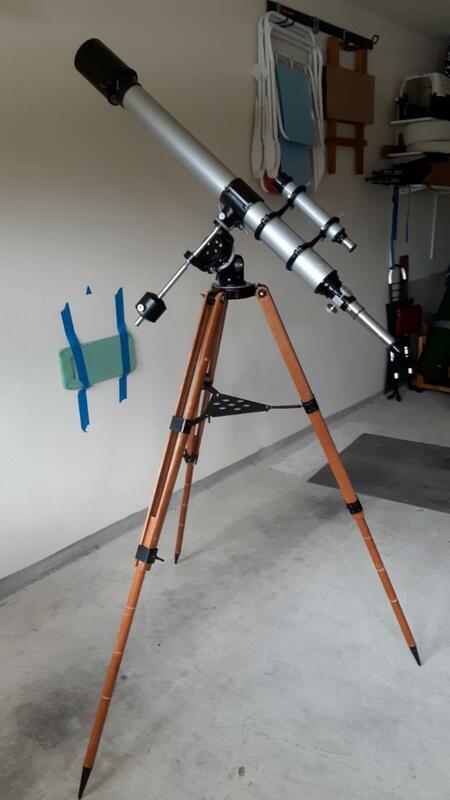 There is some overlapping between the newer 970XXX call them 1969 and up Royal branded scopes and the oldest ones going back to approx mid 1959. But there is no duplication that I've been able to come across yet. If indeed true, that really amazes me that 10 years later they were still keeping track of what serial numbers had been assigned and most likely back to day one when they started using serial numbers. Will update to elaborate or modify my statement as needed. A few pleasant surprises derived from a tip of a Meade ETX coming my way. I generally don't get too excited by ETX's, the mounts for the Autostar capable models are junk, I usually take off the tubes from 90s, 105s and 125s and throw the mounts out (even the later metal forked 125) and don't even bother with doing that with the smaller ones if I have to take them. The first pleasant surprise was the scope was in its original box, a good sign. Second surprise was it's an ETX-90 RA, the first model that was actually pretty good. The mount is a very different design from later models, motorized but not Autostar capable and made in the USA to much higher design standards. Third surprise was the baffle behind the silvered spot on the back of the corrector was very closely aligned to the spot. The 90mm's are commonly found with this baffle way off center, slowly acquiescing to gravity over time such that it can be as much as 1/4" off center. An easy fix if the corrector assembly will come off the tube but nice I don't have to deal with it. Fourth suprise was there was a flat-top "Multicoated" Meade 9mm Ortho in the EP holder...very nice, an instant addition to my vintage EP collection. But wait, there's more! Stuffed down in a hole in the cardboard packing to hold a bolt-cased EP was another Meade Ortho of the same style but 12.5mm. But wait, there's even more! Rolling around in the bottom of the box was a bolt-case held 18mm Meade Ortho, again of the same style. Needless to say these additional two have joined the 9mm in my collection. I have yet to try the scope, hopefully I won't have to collimate it is as I often have to do with these. Aside from a bit of battery leakage and subsequent corrosion on a couple of the battery holder clips the scope is in excellent condition. While I'll likely sell the scope the EPs are keepers for at least a while. Edited by Tom Duncan, 10 November 2018 - 02:42 PM. Nice, Tom. 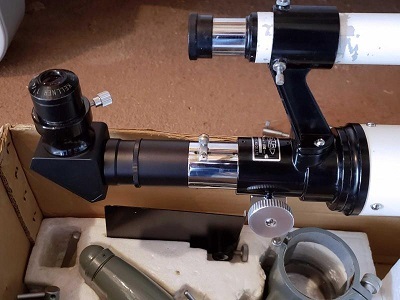 I would look at that as picking up some terrific eyepieces and a scope came with it. And it's all in such terrific shape! I can't take pics right now but it's an easy conversion. There is a black anodized ring threaded on the end of the outer R&P tube, that is really a centration guide for the sliding tube. That is removed and set aside. The inner sliding tube is set aside. You need to determine how much thread-on extension to use for your setup. 1.25" star diagonals use up more IN travel than .965" so that helps shorten things, as well. The Vixen 1.25" eyepeice holder will thread directly into the R&P tube but most scopes require at least a few inches of outward placement, so an extension is threaded into the tube, then the Vixen adapter into the end of the extension. I can't measure it now until I pull the scope back out and the actual thread specs escape me at the moment. Maybe someone can look them up before I can get to it. 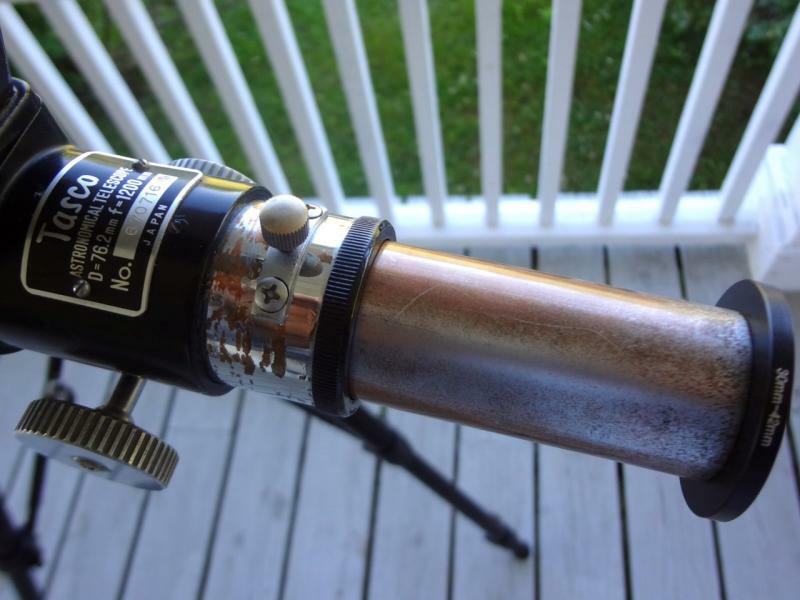 Acquired this scope from a Craigslist post in Ohio. I convinced my brother to drive out from PA to pick it up and ship it to TX. I hope it's a Sears 6339a with a RAO lens, but the focuser label fell off (only a glue stain remains) and I haven't found any other markings indicating the manufacturer or importer. The mount needed a good cleaning and re-greasing and thanks to Preston's old post about these mounts it was a straight-forward effort. Mechanically the mount & scope are in good shape, essentially no draw tube sag. But the lens is not pristine. It looks like the coating on the rear element is worn off in places - it is obvious when looking at off-axis reflections. I was hoping it was goo that would come off with cleaning, but to no avail. It's been too cloudy to get it under the stars but have looked at the neighborhood rooftops. The tripod is surprisingly shaky. From what I can tell it "twists" when jostled. I'm thinking about making a leg clamping system used on Celestron SCT tripods where a roundish metal plate threads up inside the spread of the legs pushing them outward. Or does has anyone found another solution? The only thing I can find that is missing - other than the focuser label - is the black cone-shaped thingy the the counterweight shaft threads into. Not critical but would be nice to have. 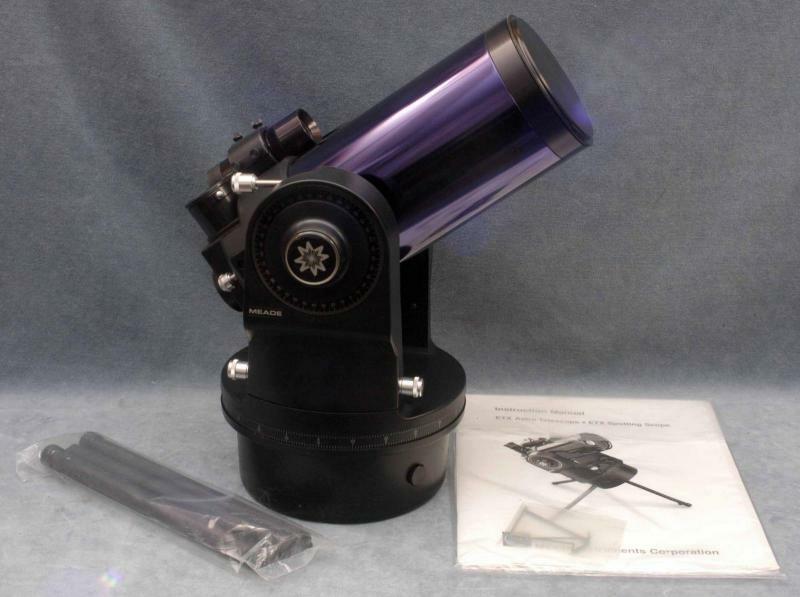 I've read lots of good things about these scopes on the forum and am looking forward to getting it under the stars. Indeed it is a Sears 6339a. It does have a RAO lens. It should give you excellent views. All of them tripods twisted to the touch. Same thing on my GP mount. To help with the twisting, don't extend the legs all the way. Also at the upper end of the round extension legs, maybe you could find something to fill in the gap. That will help. Going to wooden tray will help with supports extending thru the upper part of the tripod legs. Adding in a chain with a turnbuckle will also keeps things a little tighter. And make sure there is no slop where the worms meet the gears. Hang a big counterweight or a bucket of rocks from the tripod head. You can run the cable thru the eyepiece tray. Tighten all the tripod bolts nice and snug, and pre-load the legs if possible. The hanging weight Robert suggests is an excellent idea, old-school that works. 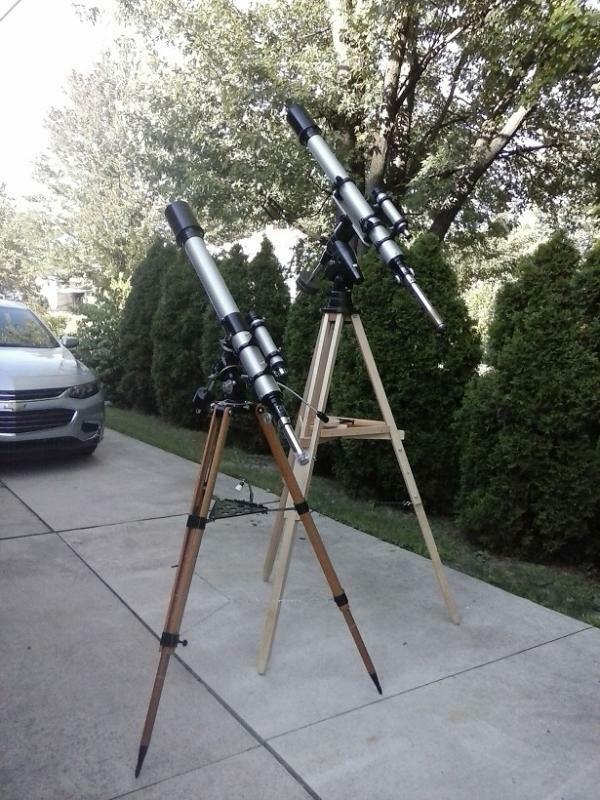 These wood tripods actually dampen vibration very well but are finicky to adjust. Thanks Chuck. I did take a good look at my 10TE last night and I see the threads you are talking about on the outer focuser tube. If the vixen adapter will screw into those threads then they are 36.4mm, this much I know. 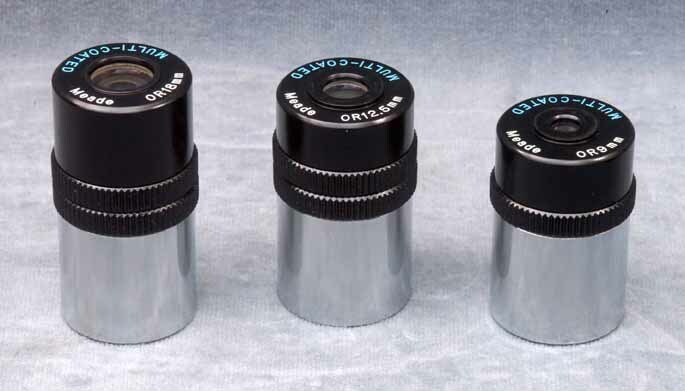 What I can't find, anywhere on the internet, is an extension tube that has 36.4mm male threads on one end, to thread into the focuser, and 36.4mm female threads on the other end, to allow the vixen adapter to thread into. The threaded extension tube is what I need help with, where can I get one of those? 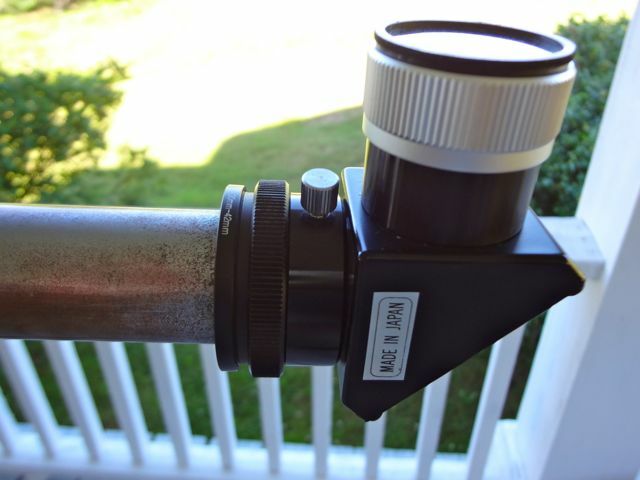 Also my plan would be to purchase a Baader 1 1/4" prism diagonal to use with the 10TE. That might change the light path length a little bit over a mirror diagonal. So a recommendation on extension tube length would be helpful too. These eyepiece adapters are a little more expensive than the Vixen adapter but they look real nice and have the necessary 36.4mm threads! Don’t know if this helps, but the extension tube that came with my Monolux 4380 threads into the 36.4mm focused tube. Perhaps you may find someone with an extra. also, instead of a threaded extension, 1.25” extension tubes that insert into the Vixen adapter can be purchased. A simpler but less elegant fix. I solved it all by using a different mount and making a bigger tripod.